Alps and Beyond is a Tour Operator in Bellinzona, Switzerland. We offer exclusive, customized tours for private groups or individual travellers. We work with you to craft the perfect bespoke program to suit all your needs. Alps and Beyond was born in 2002, from the vision of its founder, Anna Bezzola, to provide unique tours and experiences in Switzerland, Italy and the Alps, a part of the world that she absolutely loves. We started by offering walking and hiking trips for groups, with published departures. Today, we have changed our philosophy and we have opted to work only with private requests for groups or individuals. More and more people are looking for a special vacation, just for them, and we really enjoy the creative process required to design a tailor-made, bespoke tour that can satisfy all their needs. Anna Bezzola, founder of Alps and Beyond, is an official guide for the Castles of Bellinzona and the paleontological site of Monte San Giorgio, two UNESCO World Heritage Sites in Ticino, the Italian-speaking region of Switzerland. 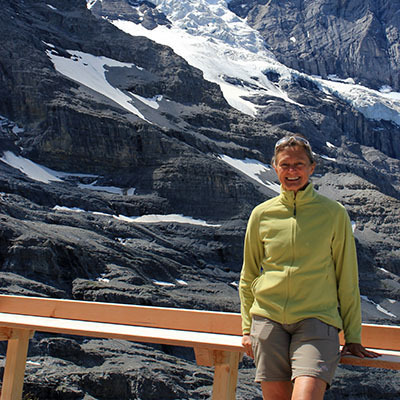 She is a hiking and environmental guide, as well as a member of two tour guides associations in Switzerland. She currently lives in Bellinzona, Ticino. Our collaborators are independent professionals, with an invaluable expertise, who have worked in the travel business for years and who share our same passion and enthusiasm. We take care of all the details of your vacation from start to finish. You tell us where you’d like to go and what you’d like to do, your overall standards, and we design a tailor-made tour for you. Organizing your own vacation and taking care of all the travel details is a lot of work. Particularly nowadays, when the information available on internet or on guidebooks is overwhelming, and it usually leads to very touristy locations or activities. Most times, travellers rely on Trip Advisor’s reviews for hotels or restaurant, with the unknown of the actual results. The work is not over once you arrive in the region, as you try to figure out how to handle all those logistics. We eliminate that burden, and take care of all of it for you! That’s what we do. We know the territory, how to navigate in it, and we know where to find the authentic and unique spots, or the special places you are looking for. That gives us an advantage and allows us to sift through a lot of approximate and irrelevant information. We try every restaurant and visit every hotel in our itineraries to make sure that they are up to our and our clients’ standards. We don’t take any chances. We communicate with you to find out what your needs are. From first contact all the way until the end of your trip, we are with you, behind the scenes, making sure everything is progressing smoothly. When on a walking or hiking tour, one of our guides takes care of all the logistics. You just sit back and enjoy. If you choose a sightseeing tour, for example to Venice, Florence, Rome, Naples and, why not!, the Amalfi Coast, you can be autonomous, with a guide only for city tours, but with all details in your hands, previously figured out by us. We just take care of you from start to finish, and deliver to you a worry-free vacation. You simply enjoy the journey. We offer a personalized service. We manage first-hand all logistics and details, and keep a direct control over the operation and quality of our tours. We make sure that everything runs like Swiss clockwork. Being a small Tour Operator with direct control on all the aspects of the operations makes it possible, as well, to offer customized programs at a contained cost. We like to think of Alps and Beyond as a small boutique instead of a department store. We strive to give our clients a personal service with undivided attention, and we focus on the utmost quality. Once you communicate to us your needs, we work closely with you to design the ideal bespoke itinerary. You may choose one of our existing exclusive tours and modify it to suit your criteria, or we can create your ideal itinerary from scratch. Once that is taken car of, we stay with you, behind the scenes, for the duration of your trip, making sure that everything is progressing as it should. All of our programs are researched and developed with great care. We always include authentic aspects for each place you visit, without which a traveller’s experience is not complete. Contact with the local people, special events, meals in traditional restaurants, are just a few of the enriching facets of our tours. Our goal is to provide an extraordinary, fun, learning experience. A guide is a valuable addition to any trip. A teacher, a friend who introduces you to places and aspects of a culture that could be easily missed, and shares stories and information not found even on the best guide books. Our professional guides are local, and an integral part of the places and cultures you visit. City tour guides are licensed, and they have years of studying and experience to back up their knowledge of history and art. Walking and hiking guides have an innate passion for the outdoors and deep knowledge of flora fauna. They are professional, with years of guiding experience, in-depth understanding of safety procedures, and caring personalities. They know the territory, read topographical maps, and identify dangers and weather patterns. Our licensed alpine guides have all of the above plus specific training and a license for more extreme activities. All of our guides are extraordinary individuals coming from all walks of life. Their intimate knowledge of the area is complemented by stories handed down to them by their parents and grandparents. They are professional, multi-lingual, friendly, enthusiastic and passionate, and will not miss any opportunity to interact with the local people, providing valuable opportunities for an authentic experience. Extreme curiosity, spirit of adventure, spontaneity and a playful attitude are the powerful engines that drive them, and that will bring everything around you fully alive. We uphold the higher standards when it comes to our services and to the quality and safety of our tours. We expect the same from all our collaborators, whether hotels, drivers, guides or other. Regardless of the type of tour or your desired comfort level, we are committed to the utmost quality. Whether your accommodations are in a five-star hotels or a “rifugio” (mountain hut), or you eat at a simple, authentic restaurant, service and quality need to meet our standards, and yours, of course. Safety first! We know it, and our guides and collaborators know it. We communicate directly with them, with no intermediaries. We share with our guides any relevant information about our clients, and we trust they will make adjustments, if needed, to secure a safe and pleasant trip. We scrutinize transport companies, the quality and conditions of their vehicle, as well as the professionality of their drivers. We visit hotels, inspect the accommodations and determine the quality of their customer service. When possible, we even choose the rooms we want for our clients. We try all the restaurants we propose in our tours. Yes, it’s a dirty job, but someone has to do it! We uphold ethical standards. We take responsibility towards the environment, and opt for public transportation for our transfers, when feasible. We respect the local people, their privacy, their culture and their customs; we support and patronize typical, authentic, restaurants, particularly those committed to sustainable farming and agriculture; when needed, we purchase locally grown produce and locally produced delicacies. We have a mutual and effective cooperation with all of our partners.